New to Lincolnshire Roadcar with 47 seat bodywork, this coach was one of a batch of four, LRC's third batch of RELH coaches. 1431 was classified as a 'coach', although it had 'dual purpose' style destination blinds and a power door from new. 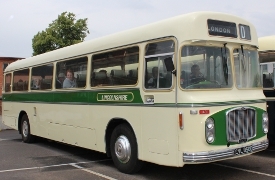 Much of its service life was based at Skegness and Boston depots, for express service D (Skegness / Boston - London) as well as tours and excursions during the summer season. It tended to be transferred to Lincoln or stored out of service during the winter months. By 1973, 1431 was still a regular on this service, by this time part of the National Express network, and 1431 was the first vehicle in the Lincolnshire fleet to receive 'National Coach White' livery. It also received a ticket machine stand and illuminated 'pay as you enter' signs for occasional use on "one man operated" bus services. 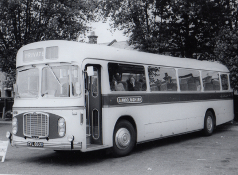 This coach was re-numbered 2231 in June 1980, and its final years were in NBC 'local coach' / dual purpose green and white livery, operating mainly on local services from Newark depot. 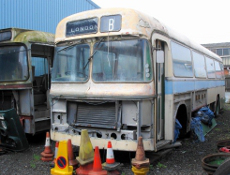 Photographs of 1431 in service can be seen on the Bristol Commercial Vehicles Enthusiasts website. After withdrawal from service in 1982, the coach was bought for preservation, and was a resident at the LVVS premises until the late 1980s. It was later sold and moved to Cambridgeshire. A further sale meant the coach stayed in Cambridgeshire, but unfortunately no work was carried out on the vehicle during this time. The vehicle then came up for sale again in March 2004 and was bought by three members of the Society. left - 1431 at Clacton, Wash Lane coach park on an excursion. right - at the Museum prior to restoration, 2004/5. After some initial work at the Museum, 1431 underwent restoration away from the Museum during 2009. A few finishing touches were needed before 1431 made a 'service' debut at the Easter 2011 Open Day event. 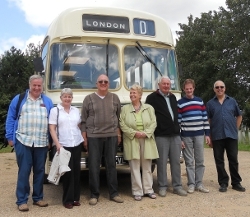 A return visit to Cheltenham, re-creating Lincolnshire Road Car's contribution to the 'Associated Motorways' network, took place in June 2011 for the rally at the former coach station site. In August 2011, the Museum was host to a visit by some retired Lincolnshire Road Car staff, and 1431 offered them a journey back in time. January 2013 - Recent work at the Lincolnshire Cooperative Workshop has included a brake overhaul, and MOT preparation. April 2013 - This has just returned from the Lincoln Cooperative workshops after servicing of the brakes and is now MOT tested.